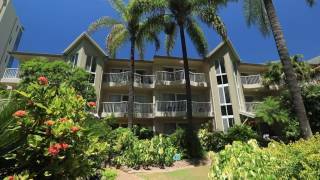 Mari Court Resort is ideally located just 250 metres from the famous Surfers Paradise golden sands beach and only two minutes by tram to The Convention Centre, Jupiters Casino, Pacific Fair Shopping Centre and all the great restaurants in Broad Beach. A shuttle bus stop at the front door allows easy access to all theme parks and major attractions on the Gold Coast. Public buses are one street away. Mari Court is your home away from home offering spacious one, two and three bedroom self-catering apartments. Mari Court features a nine-hole putt-putt mini-golf course, large tropical swimming pool heated to 27 degrees year round and spa at 33 degrees, barbecue and entertainment area, games and entertainment room with table tennis, a pool table and video games, wi-fi, internet kiosk, secure underground parking and closed circuit television coverage. All the apartments have two bathrooms and two toilets, direct dial phone, fully equipped kitchen and laundry, ceiling fans, air-conditioning, lounge and dining room, 30 Foxtel stations, flat screen television and two private balconies. The one bedroom apartment has one bathroom with a shower, one toilet and the option between a queen bed or two singles. Each apartment is spacious, modern, self-contained and has a fully equipped kitchen, laundry, lounge and dining area. Inside each apartment is non-smoking and has two private balconies for you to enjoy. The two bedroom apartment has two bathrooms with a shower over bath and separate shower, two toilets, a queen bed and two singles. Each apartment is spacious, modern, self-contained and has a fully equipped kitchen, laundry, lounge and dining area. Inside each apartment is non-smoking and has two private balconies for you to enjoy. The three bedroom apartment has two bathrooms with a shower over bath and separate shower, two toilets, two queen beds and two singles. Each apartment is spacious, modern, self-contained and has a fully equipped kitchen, laundry, lounge and dining area. Inside each apartment is non-smoking and has two private balconies for you to enjoy.